It's hard to imagine that this man born in 1900 was still racing in anger as late as 1953. Emulating 19th century men Philippe Étancelin and Louis Chiron, and preluding to what Mario Andretti and AJ Foyt would both achieve, Hans Stuck Sr managed to delay his retirement from racing until well into his fifties. Stuck's last days as a Grand Prix racer were spent with the little AFM outfit in a difficult time for war-struck Germany. Like Veritas founders Ernst Loof and Lorenz Dietrich, Alex von Falkenhausen was an ex-BMW engineer who set a modest racing and tuning shop in Munich, called Alex von Falkenhausen Motorenbau (hence AFM). Walking the same path as Loof and Dietrich, von Falkenhausen used the BMW 328 components and engine to create his first single-seater in 1949, tuning the engine until it delivered 130bhp for racing. The result was a pretty machine that was aerodynamically sound. Teaming up with old hand Stuck was a benefit for von Falkenhausen, as the former Auto-Union ace had chosen to adopt Austrian nationality after the war. This allowed him to take the AFM across German borders and compare it with the best on offer from Italy, France and Britain. There, the AFM showed what the German garagistes might have done if not for the severe restrictions posed upon German sportsmen in competing abroad. For instance in 1950, with Fritz Rieß having won the Eifelrennen in the second AFM built, Stuck ventured to the Monza GP and actually won the first heat ahead of Ascari's Ferrari. But then, in another striking resemblance to the Veritas founders, von Falkenhausen closed his shop's doors during 1951, having failed to foster a concurrent touring car project, and decided to return to BMW. That was not before the AFM had been fitted with a new Küchen engine, an Abarth-based V8 designed by Richard Küchen. With its 150bhp powering the 445kg light car the 2-litre DOHC Küchen gave the AFM enormous acceleration, which Stuck - a former European Hill-Climb Champion - put to good use in various German and Austrian hill-climbs. In 1952 the AFM - both the BMW-powered version and the Küchen car - became eligible for Grand Prix racing and although von Falkenhausen no longer developed the cars, Stuck stuck with his Küchen example, entering it in the first World Championship race of the season at Bremgarten. Lining up 14th, just behind Wharton's Frazer-Nash but leading Toni Ulmen's Veritas and the Richmond Coopers of Alan Brown and Eric Brandon, he suffered an engine failure on lap 4, the fragile valve gear of the Küchen probably the cause of its expiry. In the 1952 German GP four BMW-powered AFMs were entered by Willi Heeks, Helmut Niedermayr, Ludwig Fischer and Willi Krakau, two of them starting the race. Niedermayr finished ninth, a full lap down on the BMW-engined Veritases of better drivers Rieß and Ulmen but ahead of Klenk's Veritas and Ernst Klodwig's revolutionary Heck-BMW, Stuck's biggest success came in the inaugural Leipzig Straßenrennen, a street race through the Leipzig Stadtpark, the old fox winning the 20-lap race that was probably not a part of the East German championship at the time. Unfortunately, details on the entry list, starting grid and result of the race are missing. For 1953 Stuck decided to take part in the first British race of his life - as did the AFM-Küchen, as they entered the early-season International Trophy. 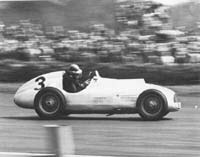 Before the war Stuck had not been part of Auto-Union's Donington line-ups so this would be his first circuit outing in Britain, an record-setting appearance for Austro-Daimler at the famous Shelsley Walsh hill-climb his only previous cross-Channel experience. As in Switzerland the year before, though, the Küchen gave up after just a few laps. Stuck then went on to the German GP but it became a disaster as the car failed on the grid. Two BMW-engined AFMs also took the start, Fitzau's car two places up on Stuck's, with the enigmatic Bechem among the last of the starters, almost 2 minutes and 15 seconds down on Ascari's pole time. Both were out by the third lap. Stuck's Monza experience was equally disappointing but at least this time he managed to bring the car home, albeit dead last. That meant the end of the road for the AFM single-seater. Its beautiful lines can now only be admired on photos, as Stuck's car was destroyed during a British historic event some time ago now. The picture sums up what is most commonly known about German Formula 2 racing of the early post-war years. Between 1946 and 1953 neither former greats like Caracciola nor the pre-war rising star Hermann Lang were the drivers, who made any deeper impressions to the German audience, but instead this man, whose career had already seemed to be on its descend many years earlier, Hans Stuck. Of course under the circumstances of the time there was no way of achieving such a grade of success as he had done in 1934, racing the famous Auto Union. Now, with no sight of any German company even thinking about Grand Prix racing, the air was of course a lot thinner for him. Despite that his story remained colorful and he was the first German driver who gained international respect again, and in fact also the only one who achieved at least a small piece of an international success. And nearly all of his post-war story is connected to the story of the manufacturer of the car, which he drives on the picture, AFM. Stuck's career had begun well back in the mid-twenties, when the Austrian born started to drive in hill climbs with Austro-Daimlers. In fact this kind of racing was his true domain where he scored most of his success and where he remained a frontrunner throughout his 40 years lasting career. In the early thirties he switched to one of the famous big Mercedes SSK sports cars, in which he also started circuit racing. An early success was his win in the 1931 Rio Grand Prix. Auto Union signed him up when they entered the Grand Prix scene in 1934 and he soon developed not only into their leading driver but with his wins in the German, Swiss and Czech Grands Prix he turned out to be the most successful driver of the season at all. In fact by the German public he was even regarded as that year's European champion, despite the fact the title could never have been awarded officially to him. In 1935 his career seemed slowly to loose its momentum, but at least he managed to win the Italian Grand Prix in a season, which "belonged" to Mercedes. But this would be the last major victory in a Grand Prix for him, and he lost his leading position in the team to Rosemeyer and later also to Nuvolari. But in spite of several efforts of the team management to dismiss him, they did not find a true replacement, especially in the critical years of 1938 and 1939, and so he could maintain his status as a team driver throughout the pre-war seasons. After the gap, which was forced by the war, he was among the first of enthusiasts to revive racing in Germany again, even if circumstances were not very encouraging. Racing could only happen on a privateer basis, mostly with some outdated machinery, which had happened to survive the war, and German cars and drivers were banned from the international scene. But in spite of his German passport, Stuck was in the lucky situation to be able to refer to his Austrian origin, so that he could circumvent this restriction and make an agreement with Piero Dusio from Italy to drive on of the nice new little 1100 cc Cisitalia-Fiats. In that car he showed his first post-war appearance at Hockenheim in 1947, where he won the race in the tiny car against much more powerful opposition, consisting of an old supercharged Maserati 6CM voiturette and an even older Monza Alfa Romeo. But then came another setback, when the Cisitalia company went bankrupt and Stuck was without a drive throughout the 1948 season. His next chance opened up in 1949, when Alex von Falkenhausen decided against his own career as a racing driver to concentrate on running his small AFM car manufacturing company. Von Falkenhausen was one of the few lucky owners of a BMW 328 sportscar and with this he nearly instantly began racing again as soon as the war was over. But in spite of some initial success he soon had to realize that he needed a modern chassis for the still competitive engine, which he had already successfully tuned completely by himself. The new car, the first one to be called AFM (Alexander von Falkenhausen, München), was a so-called "intertype", a two-seater sportscar with detachable wings and lights, which thus could be used in Formula races as well. With this car von Falkenhausen won the 1948 German sportscar championship in the 1500 cc class. For 1949 von Falkenhausen built his first true monoposto, the AFM Type 49, of which two cars were produced. In spite of the limited resources the car featured some very progressive ideas, a space-frame chassis, a De Dion rear axle and an angled mount of engine and drive shaft which allowed a very low position for the driver. And with only 420kg of weight and an power output of some 130hp certainly the car had one of the best power-to-weight-ratios of its time. The first car was again fitted with the 2-litre BMW 328 engine to form a Formula 2 car, while in the second car a supercharged 750 cc four cylinder was installed, to be raced in the Kleinstrennwagen series, which was very popular in Germany at that time. To promote his intended production of road and race cars nothing seemed more suitable for von Falkenhausen than to hand the car to popular drivers of pre-war fame. Stuck, who still was looking for a drive, was the ideal candidate, as he also was allowed to race abroad, and he fell in love with the car right from the beginning. The first international race, in which the Stuck/AFM combination took part, was the 1949 Monza Grand Prix. Pushed by the impressive torque of the long-stroke engine Stuck surprisingly shot into the lead immediately after the start of the race and remained there for the next three laps! At the end Stuck finished seventh because of a lengthy pit stop, but it had been an encouraging race for him and von Falkenhausen. Sadly the rest of the season was marked by a series of technical failures and the only success was Stuck's win at the Schauinsland hill climb. The following year Stuck appeared in Monza again. This year the race consisted of two heats and a final and during the second heat the unbelievable happened: after a fierce battle with Ascari's works Ferrari Stuck won the final dash to the line on the last lap to score 100,000 Lire and the only victory of a German car over a works Ferrari of the post-war years. In the final Stuck again led briefly but sadly he had to retire with an engine failure. But at least the race had proved that the AFM was highly competitive, even compared to the works Ferrari, while their real disadvantage to the Italian factory teams were AFM's limited resources which resulted in very poor reliability. Of course the Monza success had the intended promotional effect, especially as at the same time the Veritas Meteor, on which most German hopes had rested, turned out to be a really disastrous and underdeveloped car. This was the chance von Falkenhausen had waited for and he instantly set up a production series of Formula 2 cars to satisfy this sudden request. Of course this meant that the car had to be as simple as possible and therefore von Falkenhausen abandoned the space frame and returned to a rather conventional double-tube frame. Five of the cars were fitted with AFM's modified BMW 328 engine, but in the sixth, Stuck's car, yet another novelty was installed, the Küchen V8 engine. Stuck had ordered this car for himself and annoyed by the BMW 328's poor reliability he looked for a suitable alternative. At that time multi-cylinder engines became fashionable, like the Ferrari 166 V12. Richard Küchen, former chief-engineer of Zündapp, chose a V8 layout for his new Formula 2 light alloy engine of only 100 kg, of which only three were built. Two of them were delivered to Stuck for his new AFM monoposto, who had to put a mortgage upon his home to be able to pay them. So this makes clear that the AFM-Küchen was not the official works car but only a mere private project, a fact which was often overlooked by the German public in those years, as Stuck's old AFM 49 had always been a works entry. The debut of the car was made at the 1950 Schauinsland hillclimb, where Stuck finished third, the same result as in the next race at the Solitudering. But at the German Grand Prix, which was now open again for international entries, Stuck was forced to retire once again. In fact Stuck had to wait quite a time for his next success. But then he won the 1951 St. Bernhard hill-climb from Giovanni Bracco's huge 4500 cc Ferrari and at the Grenzlandring he led every lap of the race. In 1952 the new Ferrari 500 appeared, which meant, that all earlier cars were totally outclassed, which Stuck had to experience during the Swiss Grand Prix before his retirement. As a consequence Stuck renounced to start in his home Grand Prix and later in that season he moved over to the Swiss Ecurie Espadon to drive their V12 Ferrari, in which he failed to qualify for the Italian Grand Prix. For 1953 he made a last attempt to revive his car by installing a new Bristol engine into the old chassis, of course also a BMW 328-derived engine, but of much greater reliability. But this helped only little, and Stuck, who was now well over 50, made only sporadical appearances, the first one here at the Silverstone International Trophy in May. Sadly he did not survive the first heat, but he finished fourth at Chimay, retired again in the Eifelrennen, finished second in two minor East German races and appeared for the last time on the international scene at the Italian Grand Prix, where he finished in 18th place. But still the end of his career had not yet arrived, as Stuck later joined the BMW team and raced their saloon cars well into the early sixties.